MCMINNVILLE, OR: Creative Company expanded the brand identity system for two government associations, the New York State Association of Counties (NYSAC) and the Association of Oregon Counties (AOC). NYSAC and AOC chose Creative Company to increase visibility and perceived value with updated brand standards. Work included broadening the color palette, standardizing logo elements and building letterhead and publication templates. After speaking at a conference for county association directors, Creative Company President Jennifer Larsen Morrow was contacted by Stephen Acquario, Executive Director of NYSAC, to synchronize communications and strengthen the association’s image. Shortly after, Morrow was contacted by AOC to undergo a similar expanded brand identity program. Morrow’s presentation emphasized how audience perception is guided by the visual presentation. If documents are hard to read or don’t look professional, important information will be missed. As communication volume increases, it’s harder to capture attention and hold the interest of all audiences. Membership-driven associations must deliver high perceived value. 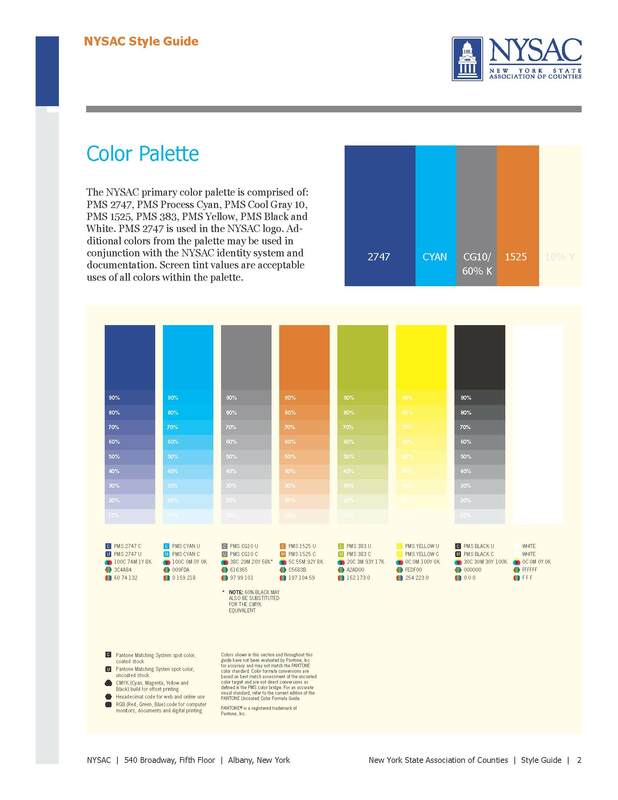 With goals to improve audience attention and perceived value, and streamline production of more attractive materials–Creative Company went to work for NYSAC and AOC. 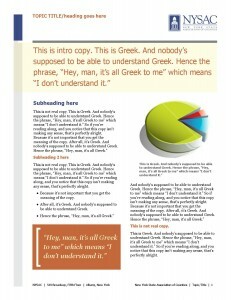 Publication template for documents, designed for easier reading with two columns, and highlights of important ideas. The expanded brand identity system for NYSAC build on the existing logo with a broader color palette, specific fonts and document layout templates. An identity guide established standards. Creative Company also wrote value statements for members and provided edits and feedback for important legislative documents. 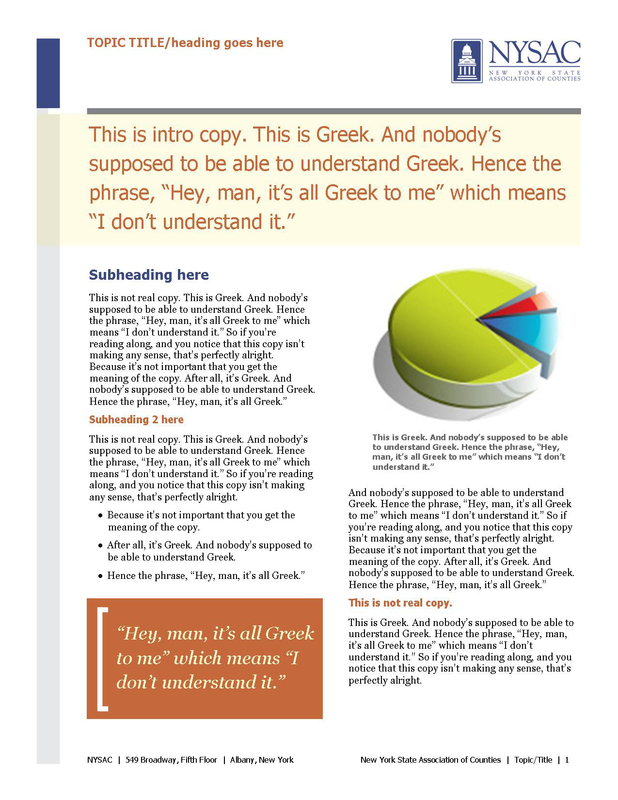 Final document templates, designed for easier reading, were created for the internal communications staff. 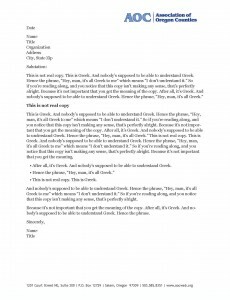 A series of email templates were designed for daily and weekly contact with members and other important audiences. “Being responsible for NYSAC’s communications, it is critical for me that we are always putting our best face forward. This work with Creative Company has enabled our Association to package and promote our work in ways that we were not able to do before. Our message hasn’t changed, but it is more valuable because it no longer gets lost in the clutter. Our form now better follows our function,” said Mark F. LaVigne, Deputy Director of NYSAC. 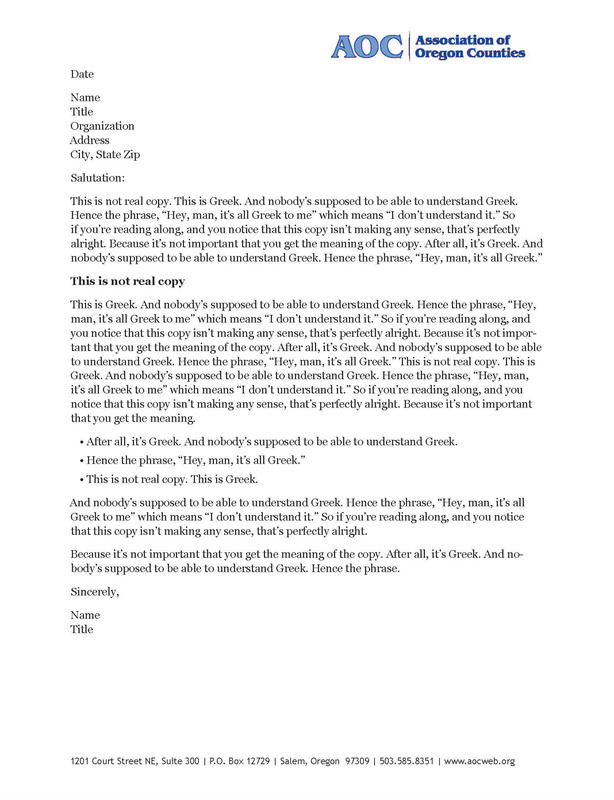 An email template for standardizing daily communications. 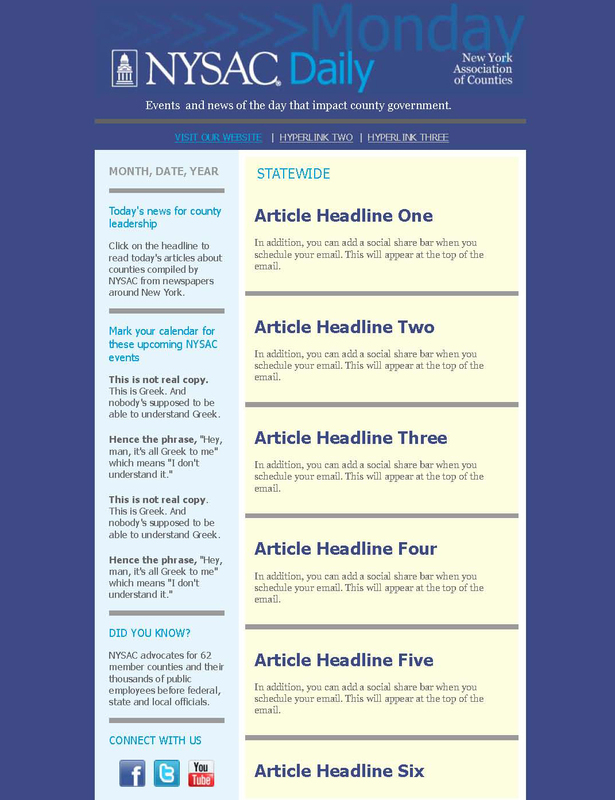 From letterhead templates to templates for booklets and brochures, NYSAC is now able to help members absorb the valuable information they provide. Percieved value is vastly improved with the refreshed brand identity system. 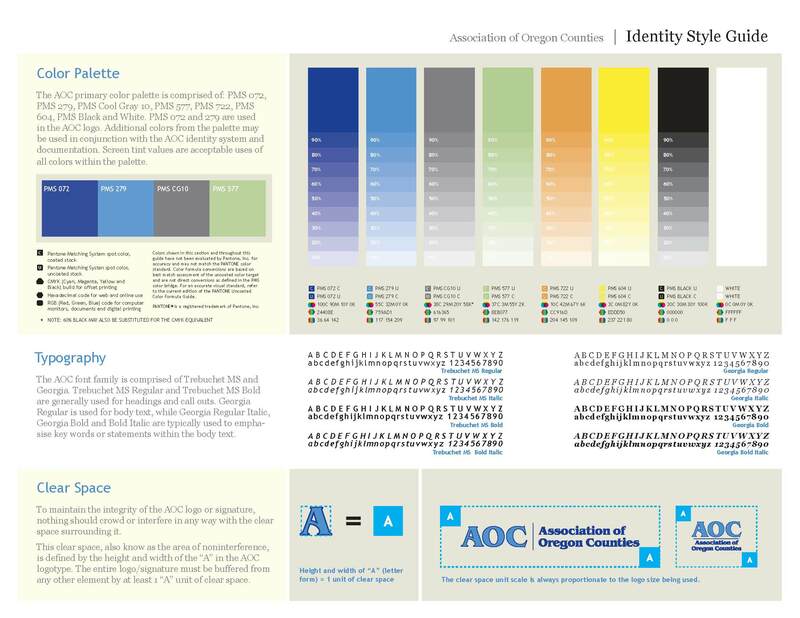 For AOC, Creative Company developed a one-page brand identity guideline, consolidated logo versions and easy-to-use Microsoft Office letterhead templates and PowerPoint templates. Brand training for office staff introduced the new brand elements and communication templates while reinforcing the value of consistent branding to improve audience perception. “In the world of membership associations, image matters both internally and externally. Members want to be able to take pride in their organization. An organization’s credibility begins with how it is perceived. Paying attention to the details of image optimizes both objectives,” stated AOC Executive Director Mike W. McArthur. The goal of the expanded brand identity systems is to increase member engagement while creating a higher perceived value. 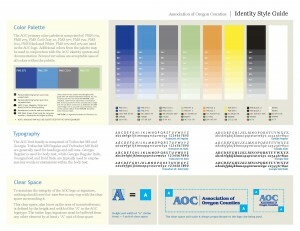 Creative Company refreshed AOC and NYSAC communications for their audiences. 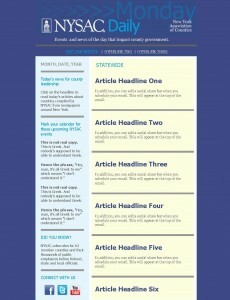 The simpler, cleaner look helps different audiences and understand key messages. “Most government associations don’t incorporate marketing or branding concepts since they don’t have a product to sell. But marketing is about understanding your audiences and communicating effectively. “Understanding how people access information — most scan and don’t read — provides the direction for simplified layouts, shorter chunks of copy with subheads, good use of color and a consistent brand presentation to enable quick recognition,” explained Morrow. A presentation on the successful brand expansion work for NYSAC and AOC was added to the continuing education series for the National Council of County Association Executives (NCCAE) at the National Association of Counties (NACo) conference in July, 2011. When other county associations contacted Creative Company for a brand review, we recommend starting with a brand audit. An audit identifies inconsistencies and how and where to simplify communications to elevate audience perceptions. Download our free e-book, 10 Steps to Optimize Your Brand to learn guidelines to creating a brand with more power and impact, a brand that boosts response to your marketing. You’ll learn how to increase response to your marketing, the importance of both the visual and verbal brand, and the value of building your online brand.